Air quality monitoring indoors is currently one of the crucial research directions that impacts the development of construction engineering, and especially designing ”passive, healthy buildings”. Monitoring and controlling such factors like temperature, humidity, and carbon dioxide levels influences the comfort of use, and has positive effect on our health. air temperature, and even slight changes may be strongly felt. However, controlling and keeping temperature at the optimum level (18 – 22°C) is expensive and determined by the energy consumption of a particular building. relative humidity, i.e. the amount of water vapour in the air, which should be kept within the range of 40 to 60%. It is not a critical parameter, and it’s not as strictly controlled as the temperature. Nonetheless, values highly deviating from the optimum range cause considerable discomfort. Humidity control is usually realized in the form of circular air dehumidification in air conditioning systems. air composition, determined by the mixture of atmospheric gases. The most significant from the biophysics perspective is the percentage of oxygen and carbon dioxide. The concentration levels of these two gases may rapidly change in a room due to their participation in various metabolic, chemical and biochemical processes. Changes in CO2 content in the inhalation air have a far greater effect on a human body than comparable changes in oxygen content. Therefore, controlling carbon dioxide levels is a crucial element of air composition monitoring. Maintaining optimum air quality and reducing CO2 concentration level requires continuous ventilation of the facility. Intense ventilation leads to increased heat emission distributed outside of the building. However, physical conditions are connected with limiting energy consumption of buildings through the decrease in heat emission exhausted outside. Economic aspects are directly connected with the costs of ventilation required to keep the CO2 concentration level within the acceptable range. Health determinants are mainly connected with adverse reactions of a human body to increased CO2 content in the inhalation air. Increased CO2 concentration causes lack of focus and drowsiness. When CO2 concentration reaches a level comparable to oxygen concentration (ca. 20%), it poses a threat to human life. Keeping carbon dioxide concentration at an appropriate level indirectly increases our work efficiency and reduces the risk of diseases caused by exposure to high CO2 concentration. In the developed countries in North America and Europe, all three categories of determinants are closely considered. In these regions, various standards and recommendations regarding the air quality and CO2 concentration indoors were introduced. EN-15251:2012, EN-15241:2011, EN-15242:2009, and EN-13779:2008 in Europe. Their aim is to ensure acceptable air quality indoors. Until 2015, two standards applied in Poland: PN-83/B-03430 and PN-83/B-03430/Az3:2000. However, they have been replaced by the aforementioned European standards. All the documents mentioned above highlight the relation between ventilation intensiveness and the number of people, as well as the type and cubic volume of a particular room. Currently, the recommended ventilation intensiveness is from 15 to nearly 40 m3/h per person. Legal regulations also define CO2 concentration limits that may have negative and dangerous effects on our health. Note that high CO2 concentration in the inhalation air (above 20%) may in critical situations even result in death. Medium concentration levels usually cause drowsiness and lack of focus. The CO2 concentration level above 1,000 ppm in inhalation air causes not only drowsiness and lack of focus, but also increased respiratory rate, dyspnoea, or palpitations. The table presents the carbon dioxide concentration levels in the inhalation air and their impact of the human body. Increased level of CO2 concentration may rapidly occur in public spaces, where there are numerous people present at the same time. This is caused by the fact that even with limited physical effort, the amount of carbon dioxide in the exhaled air reaches 5,000 ppm. Theoretically speaking, in a closed, non-ventilated 20 m3 room, a single person can change the carbon dioxide concentration level from 350 ppm to ca. 6,000 ppm during an 8 hour sleep. Hence, the concentration level of carbon dioxide can rapidly change, and that is why it is really important to measure air parameters, paying special attention to the CO2 concentration levels. Improving air quality by traditional ventilation of a room stays in conflict with the equally important guidelines on the increase in thermal insulation and limiting energy consumption of buildings. That is why the issue of monitoring CO2 concentration, humidity, and temperature levels is currently the basis for optimization of HVAC systems. Paying attention to CO2 level increases the efficiency of thermal balance management in rooms and buildings while maintaining optimum comfort of use. This is where a solution for air quality monitoring and ventilation control, such as the AXIOMET AX-CO2-1, proves to be especially helpful. 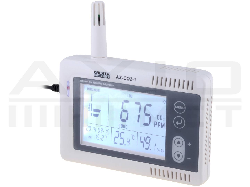 It is a digital monitoring and registering system with additional functionalities of temperature, relative humidity, and CO2 concentration measurement and capture. 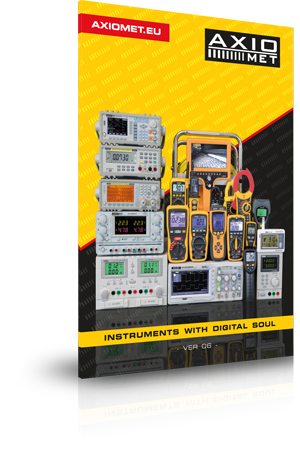 The device features a two-state output, and the states are triggered by user-defined threshold values. Thanks to that, it enables the use of a simple on/off control system within a forced ventilation system. The topic of microclimate monitoring and control in closed spaces should be considered in close conjunction with the notion of improving functionality and reducing energy consumption of buildings. On the one hand, there are economic factors related to facility operation. On the other hand, there are health aspects.